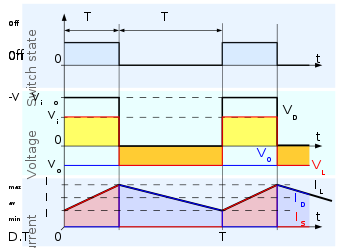 ^ The Flyback Converter - Lecture notes - ECEN4517 - Department of Electrical and Computer Engineering - University of Colorado, Boulder. ^ ST AN2389: "An MCU-based low cost non-inverting buck-boost converter for battery chargers"
^ Motorola Semiconductor. "Application note AN954: A Unique Converter Configuration provides step-up/down functions" 互联网档案馆的存檔，存档日期2016-03-04.. 1985. "... a unique step-up/down configuration can be created ... which still employs a single inductor for the voltage transformation." ^ Haifeng Fan. "Wide VIN and High-Power Challenges with Buck-Boost Converters". 2015. Christophe Basso, Switch-Mode Power Supplies: SPICE Simulations and Practical Designs. McGraw-Hill. ISBN 0-07-150858-9.